I had a lot of fun with last year's challenge because it motivated me to really look through my TBR pile and read books that fit the theme of the challenge. 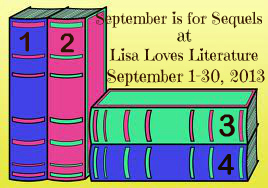 To read and review a minimum of 4 sequels between the dates of September 1st and 30th, 2013. * It would be good if you had a blog to post reviews, or you can be a Goodreads Member and post your reviews on the site. * The book must be a sequel - it can be any # in the series, just not the first book. Prequels can count if they came out AFTER the first one in the series. You can do e-books, even ARCs or e-galleys, as well as good old fashioned books. And, I'll even let you count the little 1.5 novellas that are often published as e-books only. * The deadline to sign up and participate is September 15th. * You must post on your blog an entry that has a list of the sequels you're planning to read, but it doesn't have to be complete, or you could even just post your goal, do you plan to read 8, or more? You can always go back as the month proceeds and enter the books as you read and review them. *Make sure you grab the button and put it in your entry post, or on the sidebar of your blog.